So many boats and so little time. The Oct. 25-29 Fort Lauderdale International Boat Show boasted $2 billion worth of boats and 3 million square feet of exhibits at six venues — a challenge for even the most intrepid show rover. After a hot and humid debut, Day Two was a little damp, to say the least. Torrential rain flooded the tents, forcing many to abandon their shoes, roll up their pants and wade through the aisles. Attendees braved wave upon wave of downpours that sent them scrambling for cover, where they huddled and tried to wait it out with a sense of humor. Even the tents offered no refuge from the storm, with carpets turned to swamps. But after one wet day the rain stopped, the flood receded and the sun came out. Early-bird showgoers abandoned the shelter of the tents and hotel lobbies, and climbed all over the boats looking for bargains. This was, after all, a post-subprime crisis show. As the temperature and humidity soared — de rigueur for South Florida at summer’s end — the haggling heated up, too. Glastron was offering $500 to $4,000 to help buyers make their downpayment. Motoryacht builder Carver was advertising up to $60,000 cash back on some of its 2008 models. The biggest attraction — and it was a very big one — was the 223-foot Lurssen, Kismet, the most expensive yacht ever offered for sale at the Lauderdale show. Showcased at the Fort Lauderdale Grande Yacht Club and Marina on 17th Street, Kismet was advertised for a cool $130 million. 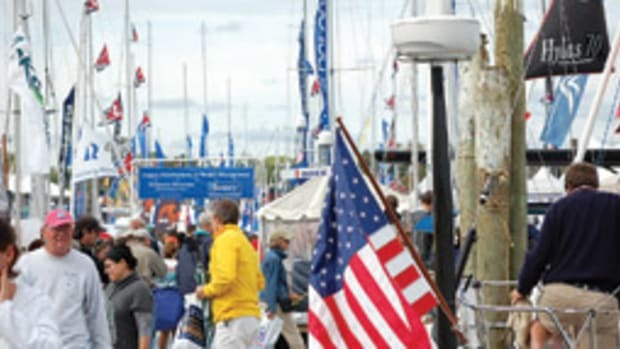 Across the street at the BrowardCountyConvention Center, showgoers sought relief from the heat in the air conditioning and more down-to-earth prices in the center consoles and cruisers — sport boats, fishing boats, family boats and ski boats smaller than 40 feet. Despite the soft market, or maybe because of it (new product typically raises the level of excitement among buyers), boatmakers debuted some new models. Chris-Craft introduced its Catalina 26, a center console fishing boat, Sunsation Powerboats its SSR Dominator, a 32-foot muscle boat. Cabo Yachts showed its new 38-foot Flybridge fisherman and Italian builder Wayachts showed its first boat ever: the Wake 46, a sleek open motorboat with chaise lounge leaning out over the open stern. Riviera Yachts brought out what it calls The Swiss Army Knife of Boats — a rugged 48 Offshore Express designed for both big-game fishing and elegant entertaining. Hatteras Yachts showed its new 72-foot Motor Yacht with resin-infused hull and full-beam master stateroom, two guest rooms, option for a third guest room and an aft compartment can be for crew or a fourth guest room. “A truly unique vessel in its size range,” Hatteras trumpeted. Skies remained skittish for the weekend, bringing attendance down about 5 percent from last year, according to the show’s producers. But the weather was good enough to bring out families and crowds of “wanna-be” boat owners. There were lots of boats to entice them, and many builders said that slow, economy or no, they sold boats.